I bet you had to adult today. Did you have to attend a meeting, contemplate about doing something bad for you versus doing something good, have somebody come ask you to solve their problem, or heaven forbid have a kid come up to you and ask you for help. Moral of the story is, adulting is hard, but there are some perks. 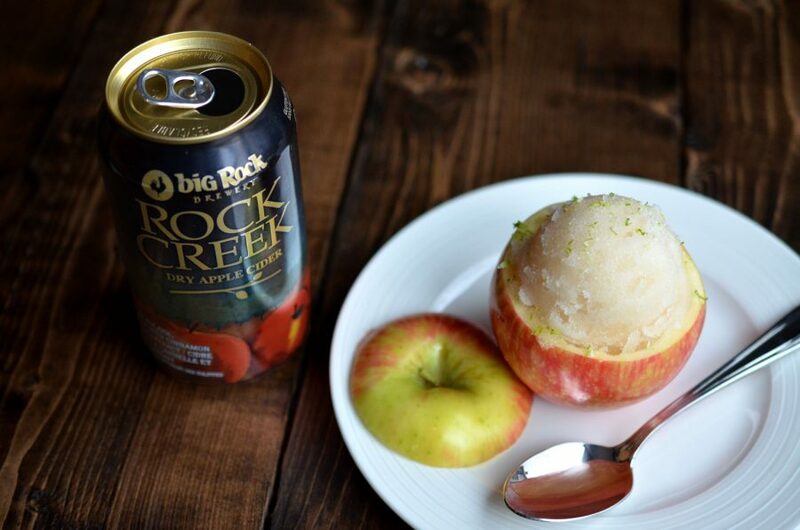 You can stay up late, eat nachos for breakfast and make sorbet with Big Rock Rock Creek Dry Apple Cider. So here’s to having a bowl full of delicious adult boozy sorbet, whether it’s 8pm or 11am. Cheers to you! Combine the cider, lemon juice and sugar in a medium saucepan. Simmer over medium heat for about 5 mins or until sugar is fully dissolved. Set aside and let cool to room temperature. Once at room temperature, refrigerate overnight. If you are using an ice cream maker, prepare according to manufacturer instructions. Place the cooled liquid into the ice cream maker and churn for about 10 mins or until a thick slush has formed. Pour the slush into a 9×9 baking dish and place immediately into the freezer. Freeze overnight. If you are not using an ice cream maker, place the cooled liquid into a 9×9 baking dish and place in the freezer. Stir every few hours to ensure the mixture freezes evenly and creates small ice crystals. Freeze overnight. When you are ready to serve, prepare the apple bowls. Cut the tops off the apples and core out the centers using a melon baller. To serve, place two scoops in each apple bowl (or regular bowl if you are not using the apples). Top with a sprinkling of lime zest. Serve immediately. If you’re looking for something sweet and crisp that makes you reminisce warm spring days, look no further than this delicious sorbet recipe. There is a book called “How to win friends and influence people”, you can skip the book and just bring this sorbet to your next BBQ, much easier and you’ll be the hit of the party. This is definitely going to be making multiple appearances this summer for an after dinner treat.